Mardi Gras On The Cheap, Y’all! My husband and I have been attending Mardi Gras festivities in New Orleans every year sans children for the past three years. Tickets to the formal extravaganzas can be very expensive, not to mention the top dollar rates that hotels charge during the very popular weekend before Fat Tuesday. One way I save money on my yearly pilgrimage to the land of oysters and beads is that I shop around for my formal attire. The thought of trying on gowns can be daunting. (I remember how much I absolutely HATED wedding dress shopping!) My ace in the hole has been eBay! While finding a dress online is tricky, I have a few tips that will help you. Amazon is a great place for formal wear, too! 2. Only shop sellers with free returns. Be weary of sellers that say all returns are final. You want a flexible seller in case the dress is too long, too short or just makes you look awful. 3. When looking for formal attire, make sure you are shopping for Amazon Prime items. Why? Because Amazon Prime offers free, easy returns. Last year, I ordered and returned over 10 dresses. All with free shipping both ways. Score! 4. Don’t just shop online for dresses. Accessories are a steal, too! 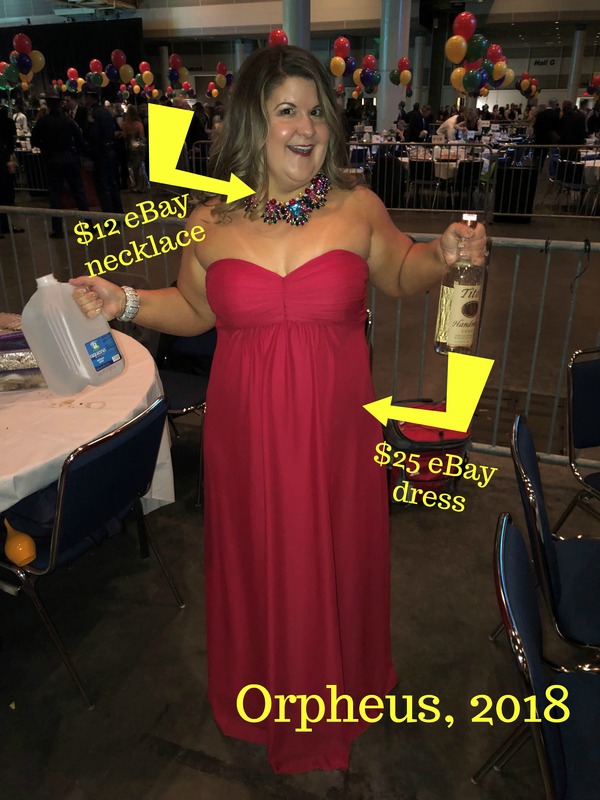 I received TONS of compliments on my red chunky necklace that I wore to the Orpheus ball. People could not believe it was only $12! I searched “red statement necklace” and found it within minutes. What’s your favorite formal attire shopping tip?